I love it when Strawberries are in season! 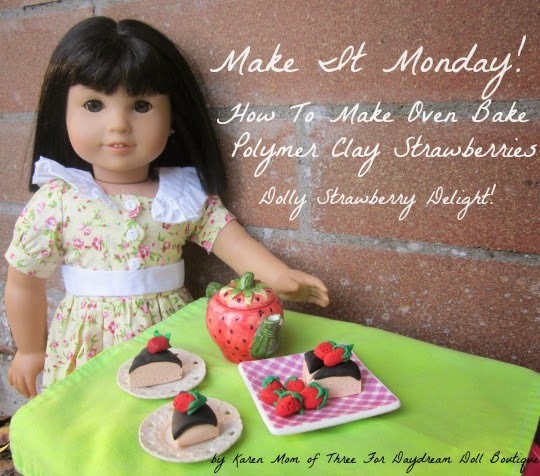 Today I wanted to show you an easy way you can add to your doll play food collection in my tutorial for making doll strawberries. Step 1- Assemble all your tools and supplies, cover your work area. 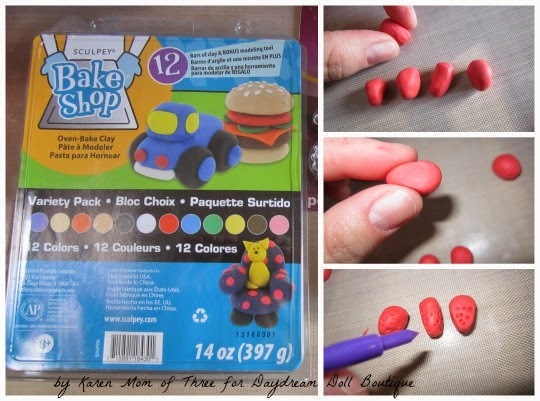 Step 3- Open your red clay package and work your clay into several small red balls as shown above. Press the red balls gently between your fingers to form the tip of the strawberry. 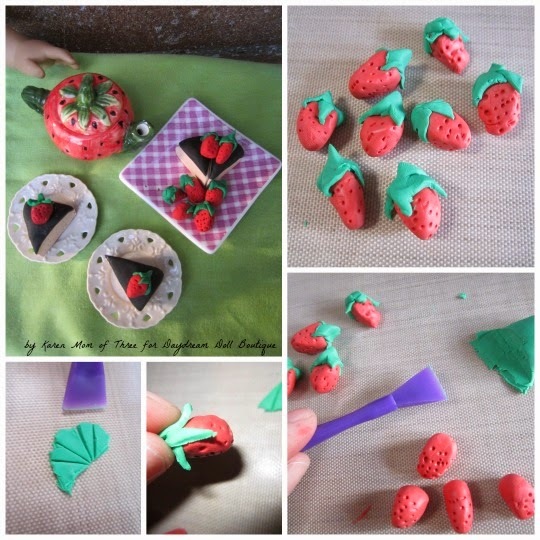 Step 4- Once you have the desired shape use your Sculpey Tool or a tooth pick to poke holes in the strawberries, this makes the look of strawberry seeds. Place them aside while you work on the stems. Remember the strawberries do not need to look exactly the same! Step 5- Open your green package and work a small amount of the clay into a long ball shape, use a craft knife to flatten an pull some of the clay into a thin flat piece. Use the knife to cut triangle leaves as shown in the photos above. Step 6- Separate the green leaves and lay them around the top of your strawberries and press into place. Repeat on each strawberry. 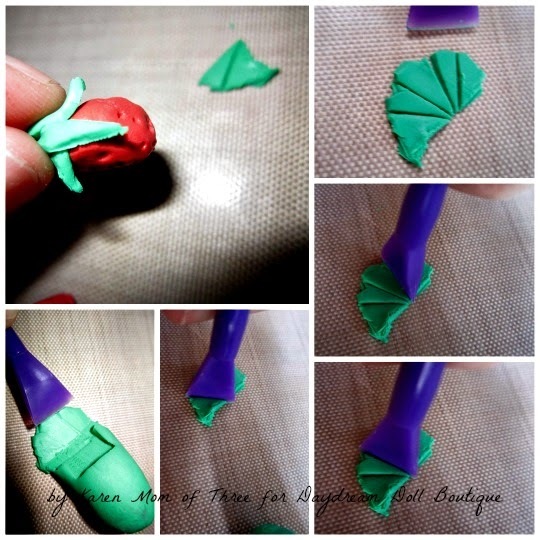 Once you have all the leaves in place "pinch" the green to make a stem at the top of your strawberries. Step 7- Once all your strawberries are assembled place them on the baking sheet covered with your work and bake mat or paper and bake them according to the manufacturers instructions. Step 8- Remove them from the oven and allow them to cool completely. 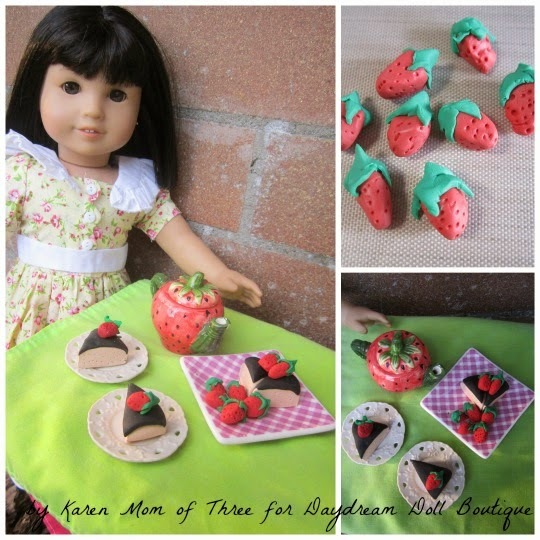 Strawberries dress up any dolly plate! Place on top of hand made desserts, on a plate or in a dolly bowl! I hope you enjoyed today's Make It Monday Tutorial! to see how I made the sponge cake you can click here to visit my blog.